I’m still a bit wowed. 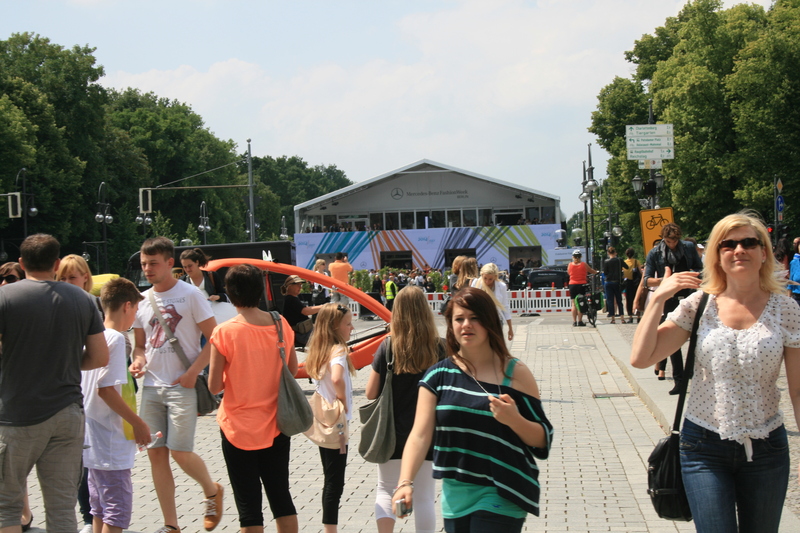 I was at Berlin Fashion Week yesterday and not only entered the big tent just across of the Brandenburg Gate where all the action takes place, I also saw two shows, went backstage and sipped a glass of champagne in the Sponsors’ Lounge. It was great! I arrived in Berlin at midday (more on Berlin in general later that week) and met lovely client Diane to get one of those super great all area passes. Then first of all we had lunch because the show we had tickets to was only two hours later. But as we completely forgot about time we then had to rush back to the main Fashion Week location, a huge tent, and went straight in to see the show. 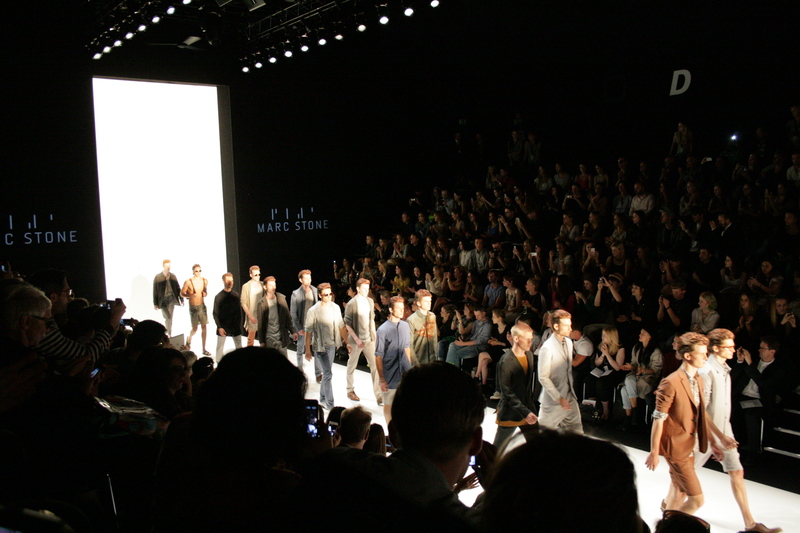 My first show was a men’s fashion show by Marc Stone. Not too exciting to be honest, because it was men’s stuff but yet cool to see a show. If you want to know about the fashion itself: generally quite wearable men’s wear except for suits with shorts. Something absolutely nobody should wear. 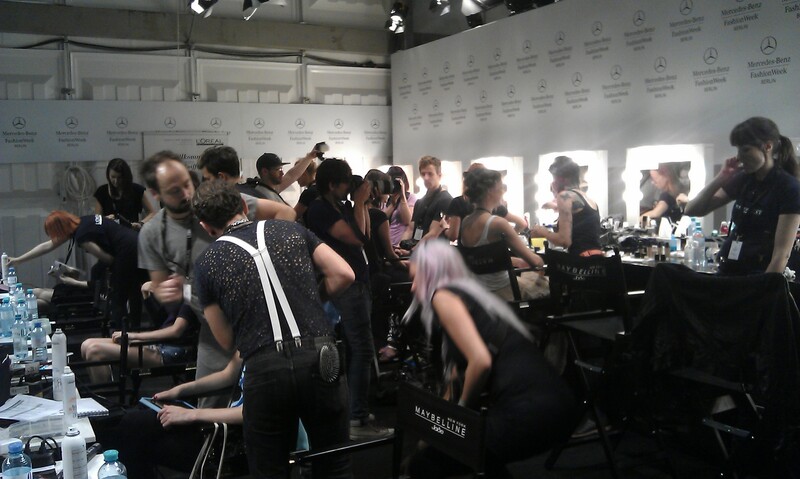 Afterwards we had the chance to go backstage and see the dressing and make up rooms. And you know what is cool? Everything there really looks like you see it in the movies: loads of people in the make up room with those hollywood style mirrors with all the light bulbs all around. And there were the dressing racks with a picture and a name of a model pinned on it in the dressing room just being exchanged for ones for the next show (you are not allowed to take pictures there though). To pass the time between this and the next show we went up to Sponsor’s lounge where you get to lounge on comfy white sofas and can get soft drinks, wine, champagne or coffee for free and where waiters walk around offering you fingerfood. Very nice indeed. The next show we saw was Riani. This was far more exciting. On one hand this was due to the fact that these were women’s clothes. On the other hand we were finally seeing a celebrity. Boris Becker was there with his wife Lilly causing of course a big commotion when they arrived. Sitting just opposite of them (well several rows further up from the catwalk) no wonder they are on many of my pictures. And the dresses? Well to be honest I thought they were ok. Quite practical and normal though… Ending the day I had a glass of champagne in the sponsor’s lounge with a former colleague of mine who now lives in Berlin and who offered me his sofa for the night as all reasonably priced hotels where already completely booked due to the Fashion Week. Thanks again to Diane, who lent me another all area pass for the evening! And finally we stopped by at the bar slash galery F37 where we checked out artistic photographs from former fashion weeks, met the artist Claudius Holzmann and Maybelline Jade’s make up Artist Boris Entrup. And guess what? I brought something for you too! Watching the Riani show we got a gift: a cute beaded black and white bow pin with Rianis logo on it complete with the little bag it came in. And I want to give this gift to you. Those of you who comment on this post until next Wednesday, 10th of July, 12 a.m. (CET/MEZ) will get into to price draw and the winner will be announced here in a weeks time! 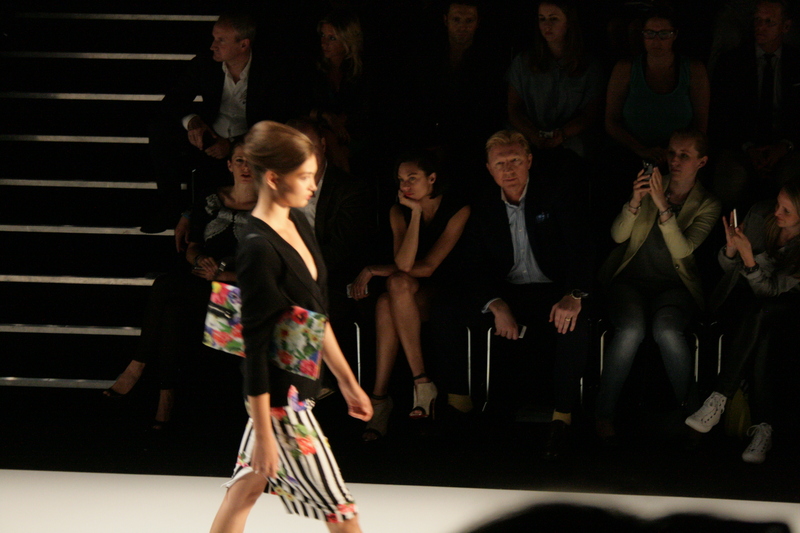 This entry was posted in Germany and tagged Berlin, Berlin Fashion Week, Marc Stone, Riani by kathatravelling. Bookmark the permalink. 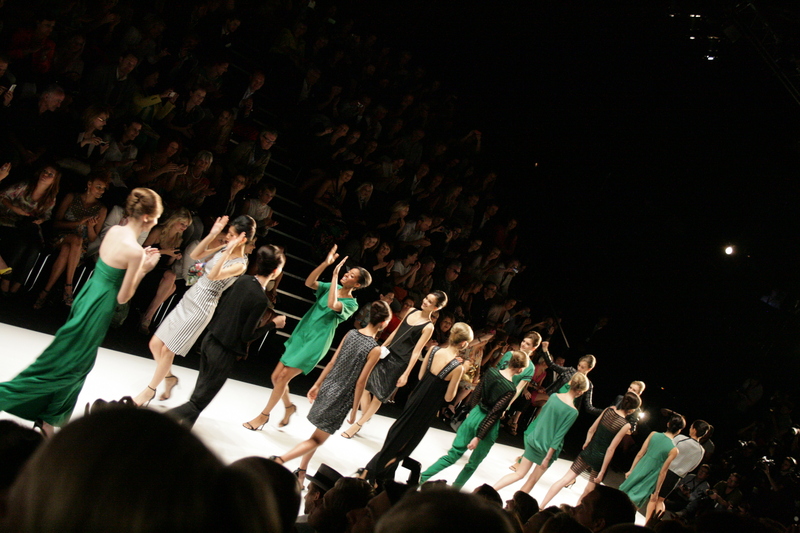 I have never thought that a fashion show, much less a whole week devoted to fashion, would be located in Berlin. I always think of Paris. And I like what I see on the models. Those are clothes most of mere mortals could wear! I subscribe to Harper’s Bazaar just because I like seeing what’s new. Thanks for the insider’s look!